This tutorial will show you how to edit a player file (.npc file) that is used by ALL players to determine starting stats, experience, inventory items, cash, and disciplines. We're going to edit Christof as an example and start a new Singleplayer game to see our changes. 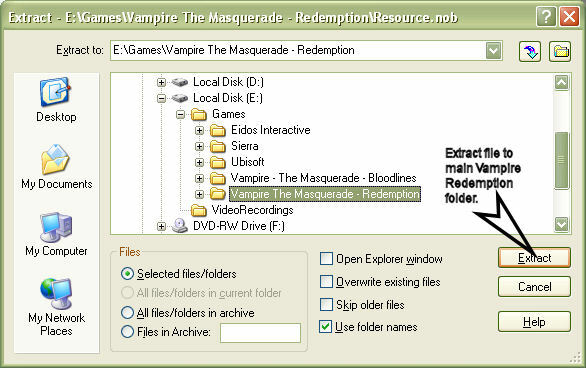 -First go to your main Vampire - Redemption directory. 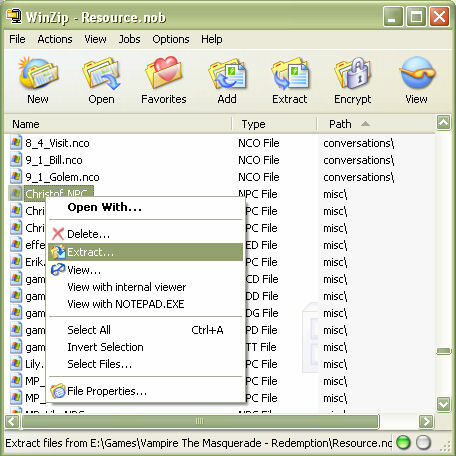 -Find Resource.nob and open it with Winzip. -Find and extract Christof.NPC located in Resource.nob's misc subfolder. -Extract direct to your main Vampire - Redemption directory. 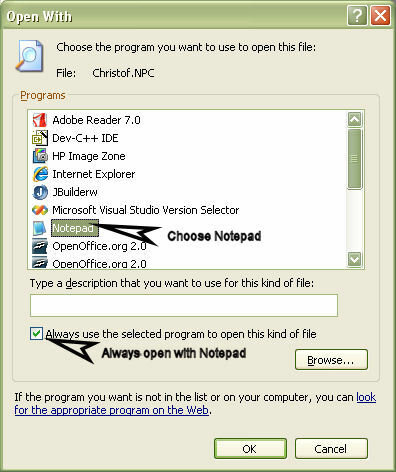 -Open the file with Notepad. 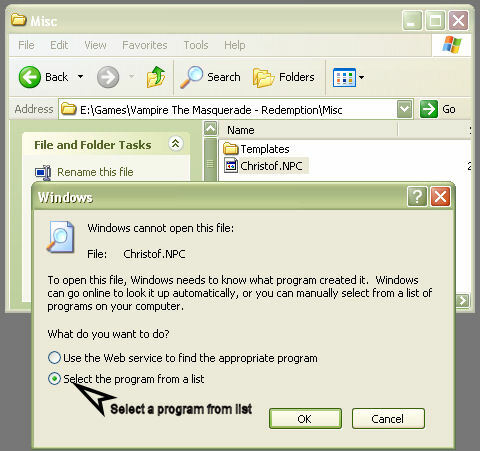 Here's how to do it in WindowsXP. 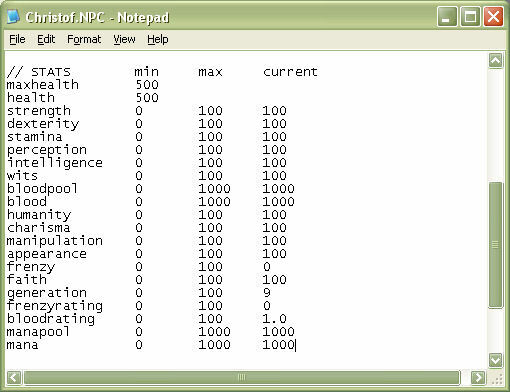 -Then pick the Notepad somewhere on the list and check mark Always open with this program. 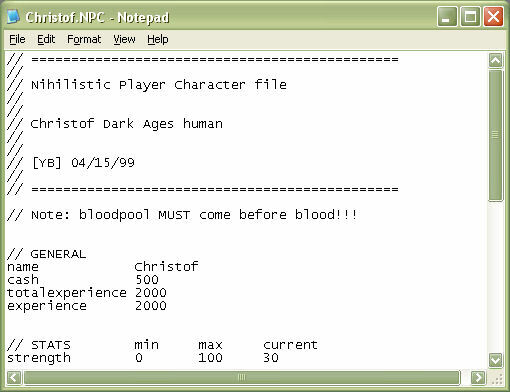 -Now we're ready to edit Christof.NPC how we want to. Here's what you should see at top of file. -The name line doesn't seem to do anything noticable so leave it. -Let's set the cash line so we can have more cash. -Just edit it like you would any other text file. -Now let's add a new line underneither totalexperience. -Here's how it should look. -Now let's move down to stats. 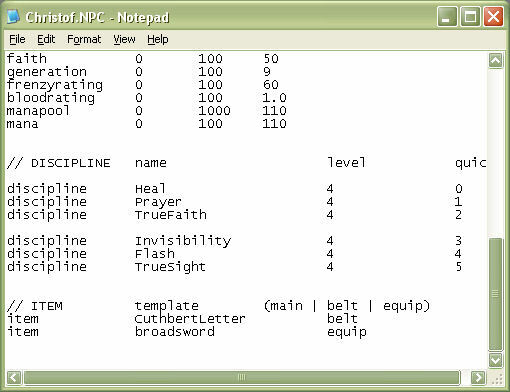 -If we want to alter Christof's starting health we'll need to add a copy of missing lines. -This image should show you not only the added lines but what you could do to the stats already in place. -Let's take a look at disciplines. 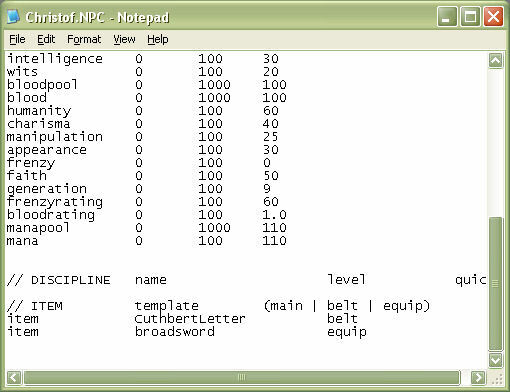 -The core names of available disciplines can be found in the game.ndd file located in the misc folder of Resource.nob. -The levels range from -1 (Unlearned), 0 to 4 where 0 is actually level 1and 4 is actually level 5. 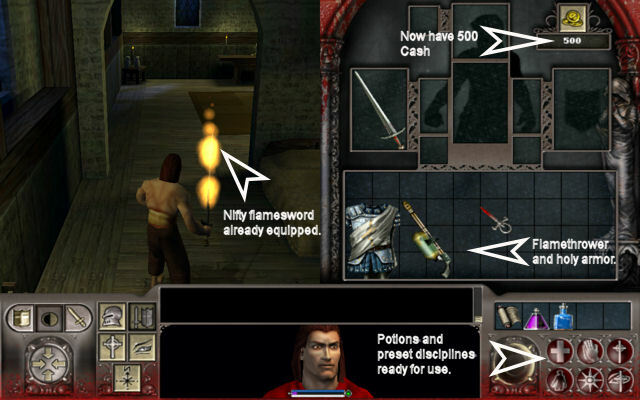 -The quick slot is located in-game on the lower right hand side of the UI screen. -It reflects those quick disciplines slots that you can access by press 1 through 6 on your keyboard in-game. -If you don't want a discipline to show up on the quick slots, just input a value of -1. -Otherwise input what's shown below. 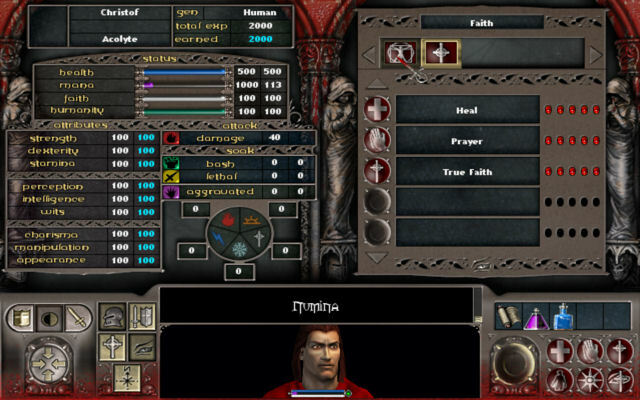 -We're going to add disciplines that were never introduced in singleplayer (Faith and Numina). Here's how it'll look. 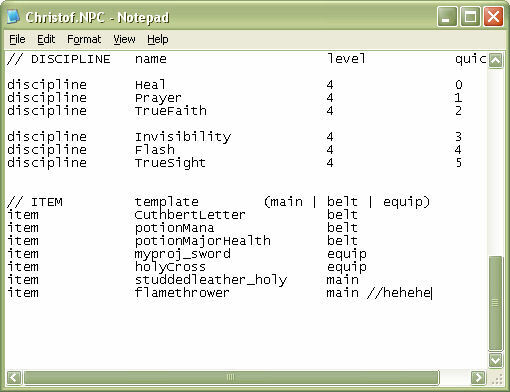 -Now let's move on to the Items section of the NPC file. -In the right hands, this can be quite a fun aspect of modding Redemption, but overall items should NEVER be added to multiplayer characters. 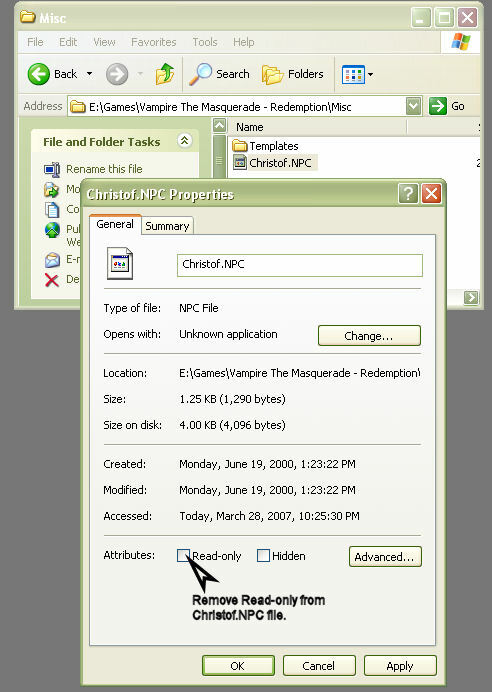 You should only add items on the NPC file of a player that is built for singleplayer gaming only. -Where the template names can be found in .NOT files that must be opened with NOT Editor. -The location key names are main (inside the inventory) equip (it's on the player) belt (it's that 5 slot little). 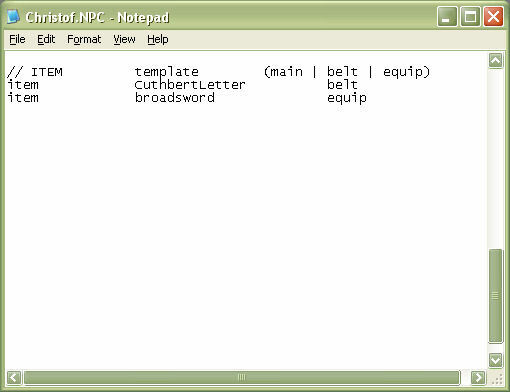 -So let's start typing new stuff in as shown on this example image. -Now save the file and load up Redemption. -Pretty simple, huh? And evil. This file has been responsible for so much trouble in this game - it's practically the reason Redemption is dead. -Here's Why: People have used this file to add MILLIONS of equipped Platemail armor that racks up the NPC file size to larger than what the network can handle (Measuring in the megabites of memory). When the player attempts to enter the server, the server crashes. -This process was known as STACK AND CRASH. This caused a HUGE panic in the entire community. No one was safe. -Several attempts were made to counter the problem, but all had failed for one reason or another. I was reluctant to post all my knowledge for this reason, but I can't see much of the harm in it now that we use Hamachi rather than WON. At least I can Block people in Hamachi, while allowing others to enter openly. I only use winzip. You can download it from the winzip website as a free trial. Actually, 7-Zip opens .nob files just fine and can create .nob files just as easily. When you install 7-Zip, just right-click the .nob files go to 7-Zip on the list and choose Open Archive. Winrar costs money, 7-zip is free open source and does exactly the same thing as Winrar for all intents in purposes related to Redemption. how can i edit the christof in my savegames ?? or my multiplayer characters ?? where are they located ? In what way are you looking to edit them? That's actually quite a broad question. for instance just the amounts of your stats whether in SP or in MP. well, SP mostly. That is exactly what this tutorial is showing you what to do. 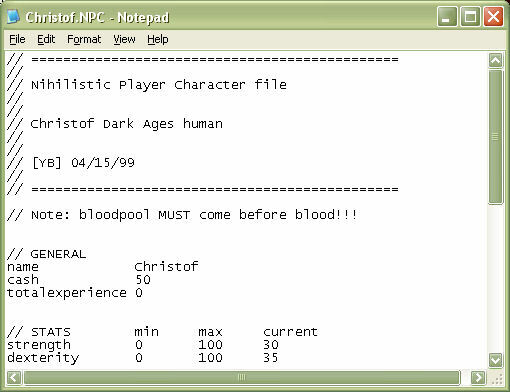 Christof uses an NPC file, you can expect the same style of editing on all NPC files for changing starting stats. Of course this method will not alter the stats on a saved game. You'll have to start a new game. He is talking mainly single player, which doesn't use a Crypt. Yeah, I see that is what he asked. I just figured he might be confused and actually want something different. After all, the tutorial explains exactly how to alter SP stats.